Dr. Chris Goldfinger is a marine geologist and geophysicist whose focus is on great earthquakes and the structure of subduction zones around the world. He is experienced using deep submersibles, multi-beam and side scan sonar, seismic reflection, and other marine geophysical tools all over the world. 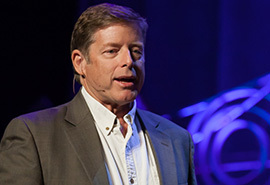 Recently, Chris was in the national spotlight after being featured in Kathryn Schulz’s article in The New Yorker, “The Really Big One.” His extensive research on the Cascadia subduction zone yielded an earthquake record extending through the Holocene epoch helping to develop a model of segmentation and earthquake recurrence. Conclusion: our area is overdue for a major earthquake. Originally hailing from Palo Alto, Chris married a Salem girl and is currently Professor of Marine Geology at Oregon State University. His dad worked for NASA; so growing up in a house filled with stuff from the early probes like Voyager, Ranger, Surveyor, etc. made interest in earth sciences a natural progression. He is also into windsurfing, ocean sailing, and aerobatic flying. Read more about Chris on our blog.